Over 75% of West Point Cadets Refuse to Give Obama Standing Ovation! Re: Over 75% of West Point Cadets Refuse to Give Obama Standing Ovation! And the CRIMINALS taking over America think we are not awake? WELL, THIS IS ANOTHER SIGN AMERICANS ARE AWAKE AND WE REFUSE TO HONOR OR RESPECT LIARS AND DECEIVERS NO MATTER WHO THEY ARE! Looks like West Point has finally awakened! Excellent! Vets are being targeted by GovCorp. Shameful! Take a look at the old VFW oath (pre 2011). 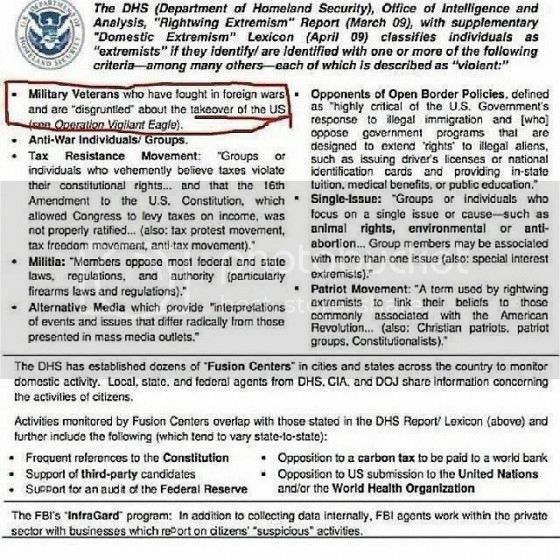 They were onto this long before the DHS existed. In the presence of Almighty God, I do, of my own free will and accord, solemnly promise and declare that: I will bear true allegiance to the Government of the United States of America, and I will always be loyal thereto, and will never bear arms, nor in any way use my influence against its Laws or Institutions. I will comply with the Constitution, By-Laws and Ritual of this Order; and I will always be loyal thereto; that I will never wrong nor defraud this Organization, nor a member thereof, nor permit any wrong to be done to either, if in my power to prevent it. I will never propose for membership any person not eligible according to our Constitution, nor one whom I know to be unworthy. I will never make known to any one not authorized to receive it any of the work of this Order. Should my affiliation with The Veterans of Foreign Wars of the United States ease, in any way, I will consider this pledge as binding outside the Order as though I had remained a member of the same. All this I promise and pledge upon the honor of a true Comrade and a citizen of our great republic. Since membership has been in the dirt, they changed the oath. There are still plenty of eligible vets that consider this a worthless organization.